This famous writer was born Joseph Rudyard Kipling in Bombay on December 30th, 1865, after his mother Alice Macdonald, a methodist minister’s daughter, and his father John Lockwood Kipling, an artist, moved there so John could work as the director of an art school. Kipling lived happily in India until he was six, when his father sent him back to England to study. At sixteen Kipling returned to his parents in India and worked on the Civil and Military Gazette, also writing and publishing a number of poems and stories. Kipling returned again to England in 1889 where he gained fame and credibility with his publication of Barrack-Room Ballads. In 1892, he married an American, Carrie Balestier, sister of his dear friend and sometimes partner, Wolcott Balestier, and settled with her in Vermont. There he wrote Captains Courageous and The Jungle Books, and Carrie gave birth to their first two children, Josephine and Elsie. The family moved to England in 1896 and settling in Rottingdean, Sussex the next year. Here their third child John was born. Unfortunately their daughter, Josephine, died during a family visit to the U.S. in 1899. Around this time Kipling was deemed the “Poet of Empire” and produced some his most memorable works, including Kim, Stalky & Co., and Just So Stories. In 1907, Kipling accepted the Nobel Prize for literature. In 1915, his son John died in the battle of Loos, during World War I. Kipling continued to write and became involved in the Imperial War Graves Commission. In January 1936, Kipling died, but not before the completion of his autobiography Something of Myself. As Britain entered a high expansionist phase at the end of the nineteenth century, Kipling became the great imperial poet and propagandist. The empire covered over a quarter of the world’s land surface, and included more than a quarter of the world’s population. Kipling would see the beginning of the imperial downfall after the World Wars, as nations would eventually acquire some degree of political autonomy and, eventually, independence, although Kipling would never see the complete end of the empire after the end of the Second World War. Kipling saw the Empire as a way to maintain stability, order, and peace amongst the people he considered to be “heathens” (see Myths of the Native). In his view, the British presence in under-developed countries helped to relieve famine, provide medical assistance, abolish slavery, and construct the physical and the psychological groundwork for “civilization” (See Anglophilia, Cricket). 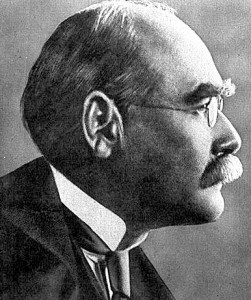 Kipling’s ideas were backed by political, racial, moral, and religious beliefs which held the British as a culture of superiority with a moral responsibility to the “uncivilized” world. In a speech to the Royal Society of St. George in April 1920, Kipling spoke of the men who created the Empire: “… they did establish and maintain reasonable security and peace among simple folk in very many parts of the world, and that, too, without overmuch murder, robbery, oppression or torture.” Kipling’s view of the British rule is now seen as naïve and idealistic. Kipling believed that ideally the colonized should recognize their inferiority and accept their governed position (see Orientalism). Although Kipling lived in India and was exposed to its cultures, he made himself the interpreter, propagandist, and chief apologist of the imperialist elite. Kipling was suspicious of democracy and of the members of the British Liberal Intelligentsia who opposed imperialism as a philosophy. He saw World War I as a threat not only to Britain itself but to her civilizing mission. Kipling believed that in Imperialism there were five “points of fellowship” necessary to develop and settle colonized areas. These five points were education, immigration, transportation, irrigation, and administration. By conquering these elements of civilization, the mother country had created a better and more civilized nation from the colony. Imperialism was not so much a narrow political subject as it was a way of moral and social life. Kipling’s ideal of imperialism in India was that of a paternalistic, quasi-feudal imperial one. As “legitimate” and benevolent rulers, the British took a privileged position at the top of the social chain with a systematic mode of government . Kiplings could have easily been influenced by the spreading ideal of social Darwinism, a societal spin on Darwin’s order of the natural world. For Kipling, hierarchy was natural and was determined by survival of the fittest. Imperialism could not be corrupt to Kipling, because social order is fated, therefore moral. Kipling’s Kim is a novel about a young European boy in India, Kim, who travels with a Tibetan lama on his search for a river of purifying water. Kim also works as a spy for the British Secret Service, using his tanned skin and manipulation of language to move in and out of the role of a native. In his introduction to the novel, Edward Said points out Kipling’s use of “the dominating viewpoint,” regarding English rule as natural, beneficial, even ordained. From this perspective, Kipling could not see the enormous changes in India produced by Imperialism. In Kim, Kipling depicts India still full of ancient customs and tradition. However by the time Kim was written in 1901, India had already been radically altered by the English “reformations” and the Indian Mutiny of 1857 had occurred. These “reformations” dispossessed or altered nearly every class: the new system of higher education based on the English model crushed the old religious elite; the democracy of the judicial system offended the honor of the highest castes; free trade transformed urban artisans into beggars; and the unrestricted sale of estates ended traditions of rural life. In Kim, it is obvious that Kipling did not see imperialism as any type of disruption, exploitation, or subjugation, but as economic development and moral enlightenment for India. In the novel, working as a spy for the British Empire and looking for spiritual harmony work side-by-side. British rule is never challenged; instead Kipling uses several minor characters strictly for the purpose of advocating British rule. Although Kipling shows a knowledge of a number of Indian languages and the capability of using many voices, there is no variety of viewpoint. All voices hold one style and one dominant point of view in favor of British imperialism. Kipling’s use of Indian words and phrases lacks any attempt to represent the their cultural specificity. Allen, Charles. Kipling’s Kingdom. London, England: Micheal Joseph Ltd, 1987. Childs, Peter. Post-Colonial theory and English Literature. Edinburgh: Edinburgh University Press, 1999.
Cooper, Alice Page. Rudyard Kipling. Garden City, New York: Doubleday, Doran & Comapany, INC., 1926. Kipling, Rudyard. A Book of Words. London: Macmillian and Co. Limited, 1928. Moses, Michael Valdez. The Novel and the Globalization of Culture. Oxford, England: Oxford University Press,1995. Tompkins, J.M.S. The Art of Kipling. England: University of Nebraska Press,1959. Thompson, Jon. Fiction, Crime, and Empire clues to Modernity and Postmodernism. Chicago: University of Illinois Press, 1993. Allen, Charles. Kipling Sahib : India and the making of Rudyard Kipling. London : Little, Brown 2007. Havholm, Peter. Politics and awe in Rudyard Kipling’s fiction. Aldershot, Hants, England ; Burlington, VT : Ashgate Pub., 2008. McBratney, John. Imperial subjects, imperial space : Rudyard Kipling’s fiction of the native-born. Columbus : Ohio State University Press, 2002. Randall, Don. Kipling’s imperial boy : adolescence and cultural hybridity. New York : St. Martin’s Press, 2000. Raskin, Jonah and Bruce Robbins. The mythology of imperialism : a revolutionary critique of British literature and society in the modern age : Rudyard Kipling, Joseph Conrad, E.M. Forster, D.H. Lawrence, and Joyce Cary. New York : Monthly Review Press, 2009. Simmons, Diane. The narcissism of empire : loss, rage, and revenge in Thomas De Quincey, Robert Louis Stevenson, Arthur Conan Doyle, Rudyard Kipling and Isak Dinesen. Brighton : Sussex Academic Press, 2007. Author: Shaina Gopen, Fall 2000. P.s. The citation for Said’s “Orientalism” is missing- and- as much as it pains me- his assertions regarding Native Indian receipt/reaction in Kipling studies are being widely questioned throughout Indian and Pakistani Universities. Since reading today’s report in The Guardian re Boris quoting Kipling, I have been poking about looking for explanation of why Recessional, Whiteman’s Burden and other works leave me feeling that Kipling was pretty jaunticed about empire building. I’m glad I’m not the only one who cannot see how his body of work can be dismissed as Jingoism. The appraisal of ‘Kim’ from a post-colonial perspective in the above piece is wholly unrewarding and unenlightening and – ironically – possesses far more bias or narrowness of vision than the accused Kipling. The novel is remarkable for its sympathetic imaginings, its caste blindness, its breadth of Indian types and its portrayal of adolescence as well as its sheer affection for India. The essay above, meanwhile, displays cliched post-colonial responses, lacking imagination and breadth of vision. Englishmen are as contradictory and impossible to sum up as Indians – as Kipling shows in the novel. Whilst I applaud so many of the Indian novels written in English from the last forty years, so many of them (Rushdie excluded) insist on highlighting India’s cruelty and focus primarily on the Indian middle classes. Rushdie’s novels, however, seem more of a direct progression from ‘Kim’. However fanciful and imagined, both communicate India’s wonderful diversity and colour, the very qualities many see as all mankind’s hope for the future. What a miserable, small minded little essay this was!